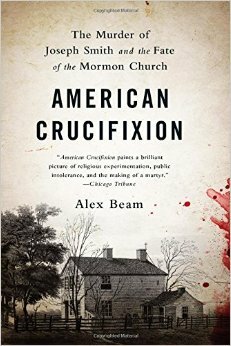 Boston Globe columnist Alex Beam’s new book may be very helpful to many readers who may not know very much about Mormonism, let alone the facts surrounding the death of Mormonism’s founder Joseph Smith at the hands of an angry mob at the Carthage Jail in 1844. American Crucifixion–the title obviously refers to Smith’s death, with a figurative reference to the manner of how Christ died–is written in an easy-to-read style that should be understood by any reader, even those who may not be familiar with the history of early Mormonism. Beam shares some background information to Smith in chapter 2 (“King Joseph”), perhaps enough to give enough of a basic understanding about the controversy of the LDS Church founder. The main focus of the book is covering the final few years of Smith’s life in Illinois before he was killed at the young age of 38. The best thing about the book is that it is written by someone with no dogs in the fight, as Beam doesn’t come across as either Mormon or, as some Latter-day Saints put it, “anti-Mormon.” He lays out the information, matter-of-factly, without trying to provide excuses or making it appear that he delights in the death of the Mormon prophet. Although I am not an expert on Joseph Smith, I have read other books that have fully covered Smith’s life, and from what I can tell, Beam is accurate in his assessment. This doesn’t stop one critic on amazon.com writing, “But if you are LDS and you are looking for something that is faith promoting i recommend to find another book.” Could this be the best compliment an objective writer of history could ever desire? As expected in a book focusing on Smith’s death, Beam focuses much attention on the events leading up to the murder. When the only edition of the Nauvoo Expositor was published by those who once aligned with Smith’s teaching, all hell broke loose. The events of the killing are right in line with the historical teachings and will not be disputed by scholars. For me, the highlight of the book was the description in chapter 12 (“Trial by Jury”) of the trial of Smith’s killers and how they were able to be exonerated. There were details included there that I had never read before. The book is in need of further editing, as there were some sentences that had awkward construction. There were also several cases of wrong words that were used (i.e. “In his diary” instead of “In his diary” on page 97 and “trail” instead of “trial” on page 217). Hopefully a second edition will correct these easy-to-miss mistakes. Overall, I recommend this resource. for those who are interested in this topic.